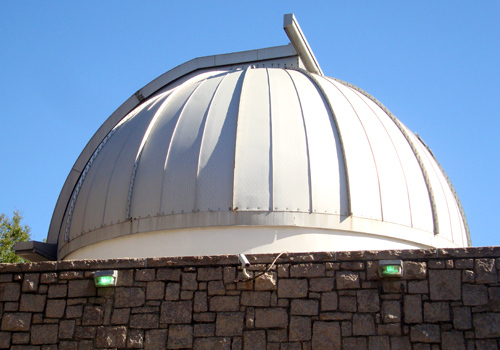 The Jim Cherry Memorial Observatory, or Fernbank Observatory as called by locals, is home of the largest public telescope in the southeastern United States and one of the only instruments in the country dedicated solely to education. The telescope also is a source of starstruck excitement for all who peer through it. 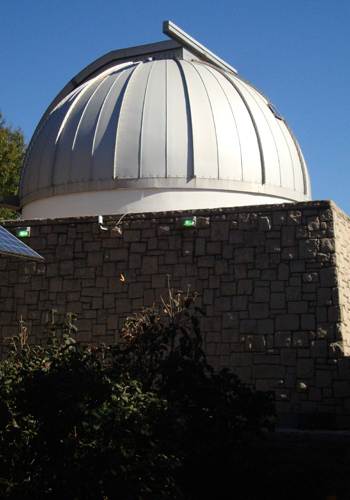 The Observatory, part of the Fernbank Science Center, is open for public viewing at dark on Thursday and Friday nights when the skies are clear. Tickets are not required, reservations are not required, and the viewing is free. When I recently went to the Observatory on a Friday evening, I had just finished a program at the Fernbank Planetarium, located in an adjacent building. The same astronomer who led the planetarium program also served as the host at the Observatory. She had to close the planetarium projection system down before opening the Observatory so we started a few minutes after the scheduled 9:00 p.m. start time. Most of the attendees of the planetarium program stayed for the Observatory viewing and dozens more came only for the viewing. There were at least 60 people there, including students, parents on a scientific discovery excursion with their kids, couples who were obviously on a date, and of course a few fun-seeking tourists. As soon as the gate opened we climbed the steps of the base, built of blocks of granite from Stone Mountain, to the level upon which the 30-foot dome sits. While we were waiting for our turn to see the stars, a tour guide pointed out constellations using the most powerful laser pointer I’ve ever seen. He later told us, at the prompting of an inquiring student visitor, that to carry that laser pointer requires a license. I believe him given its strength—enough to easily point out the stars he was discussing. By pure chance, when the astronomer was pointing to a constellation directly overhead, those of us who were engaged in the celestial tour saw a meteor—a shooting star. I think my wish was for the line to move a little more quickly…the temperature had dropped. Once inside the dome, the line went pretty quickly (wish granted). By then it was 9:30 but we had been so entertained by the second astronomer that we didn’t realize how much time actually had passed. I was thankful for having worn long sleeves though. By time I got to the telescope viewing point, we’d figured out that the telescope was pointing toward Jupiter. The strength of the Cassegrain reflector telescope allowed us to see Jupiter's orange color and the familiar bands created by the planet’s swirling atmosphere. We also could see the largest four of its 60-plus moons: Ganymede, Callisto, Io and Europa…invisible to the naked eye, but all were shining brightly through the telescope. It was indeed an exciting moment…seeing so clearly our solar system’s largest planet, once a total mystery to mankind, still largely mysterious to most. Will I return to Fernbank Observatory? I welcome any chance to gaze at the stars, and given that our planet is continually spinning on its axis, changing the night sky, there will always be something new to see.